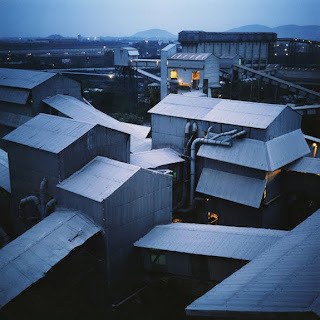 Dayanita Singh's Blue Book, showing at Galerie Mirchandani + Steinruecke, consists of photographs of industrial landscapes and interiors. The former were shot at dusk using daylight film and a slow shutter speed, causing a melancholic blue to permeate the images. When shooting inside buildings, or exteriors in which the sky is largely hidden (these were shot in brighter light), Singh sought out bits of blue, a piece of cloth here, the rim of a porcelain dish there, to spark the frame. In this respect, her method reminds me of the Japanese maestro Yasujiro Ozu's use of red in films such as Autumn Afternoon. Landscapes, traditionally, are expansive; since the nineteenth century the favoured way of representing them has been the panorama. By keeping to the square format with which she has come to be associated, Singh counters the impulse behind panoramic photographs and paintings. Instead, she offers compressed, carefully framed views of factories, most of which are displayed in a small 18" by 18" prints. The play with scale is accentuated when we see views of rooms in a significantly larger size. This seedy dispensary demonstrates the balance Singh achieves in her compositions, evoking the painterly tradition of still life rather than the news photographs with which she began her career. While the Indianness of Blue Book is discernible on close viewing (a distant temple in one of the photos, Devanagari writing in another), any specific information has been excluded, as have human beings from all but one of the frames. We have no idea which steel, cement or newsprint production facility we are looking at. The story, to the extent there is one, is told by the machines and sheds, and develops into a kind of elegy to industrial society, a sense that these things belong in the past even though they are very much of the present and will continue to be central to the future. 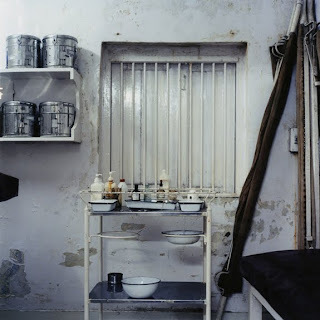 Atul Bhalla also uses photographs and location, but in a diametrically opposed way. For a number of years now, his work has focussed on the river Yamuna and the streets of Old Delhi; the two are linked not just by their proximity but through the artist's preoccupation with the theme of water. Traditional drinking fountains and water vendors; ritual prayers offered in the river; pump houses built along the bank; and the incursive, smoggy urbanscape have featured in his sculptures, installations and photographs. Each image in his current series on view at Project88 comes signposted with a specific address, quite unlike Dayanita Singh's anonymous edifices. Also unlike her, Bhalla does not seek purity in his works. He is happy to use multiple images in a single piece, or to paint over a photograph, as he does when obscuring the traffic in a picture to highlight the flowering plant at the frame's centre. One large work I liked a lot consists of photographs of dozens of pump house built along the Yamuna after a disastrous flood a couple of decades ago. At first sight, one thinks it's the same building replicated, but then one notices variations in the state of repair of the broadly identical structures. One is drawn into an amusing game of spot the difference even as the ugliness of the PWD construction becomes increasingly manifest. Is Avatar a Hindi movie?